A reading from the gospel of Mark 12:38-44. And remember that the gospel of Mark records this story as taking place inside the temple in Jerusalem. Days before Christ’s arrest and crucifixion. Listen for God’s word to us. About a hundred years ago in Europe, Sigmund Freud and Carl Jung met. Freud, known as the founder of psychoanalysis, and Jung, known as the founder of analytical psychology; corresponded first, then worked together for a few years. Elder Freud was excited about the possibility of passing on what he began to Carl Jung, who was his junior. It never would work, however, because the two held drastically different views. Both were curious about the messages that come in dreams. The images that arise from our unconscious. Freud believed it all to be a sign, while Jung believed what comes to us in our dreams are symbols; some say gifts from God to guide us on our way. It sounds like just semantics, I know. But meet one of them – or sit in a session with a counselor schooled in the tradition of one or the other and you will note a significant difference. Signs, according to Freud are interpreted by the expert. So, in Freud’s view, if you dream about water, he would tell you it has something to do with birth. If you dream about animals or little varmint, Freud would tell you they represent your siblings. Symbols are different. Jung believed symbols come from the dreamer’s unconscious to reveal the dreamer’s great wisdom – the spark of the Divine living within. While many of us approach several symbols similarly, so that Jung concluded we have a collective sense of things; only the dreamer can uncover the meaning of the symbols revealed in their own unconscious. So, when asked, a dreamer might say that a small copper coin represent a diminishment of wealth. A lucky penny. Or even the greatest sacrifice of your life. As Jesus sat in the temple with his disciples one day, he reminded them to beware. Beware of those who want to show off their great status. Those entrusted with holy things who crave public recognition over humble service. Beware of those who want the best seat everywhere but pay no mind to a place for the vulnerable. Beware of such impulses in ourselves, I think Jesus intended to say, especially to those who want to get on board in his movement. Calling ourselves his disciples, but not so sure we’d be willing to let the last go first and the least receive the most. He’s nearing the end of his lessons with his disciples. In Jerusalem for one last Passover, as the great shepherd becomes the lamb. They sit opposite the temple treasury, as Jesus invites his followers to join him to observe. Sit a spell to people-watch. Imagine the colorful scene. Pilgrims from all over have traveled to Jerusalem to be a part of the great feast of Passover. Many likely had the financial means to attend the celebration every year. Others were there, wide-eyed in awe, as they’d get just that one chance in their hard-knock life to be there. It’s believed widows would flock to the temple. After all, care of widows, orphans, and foreigners repeatedly was commanded in ancient Israel. 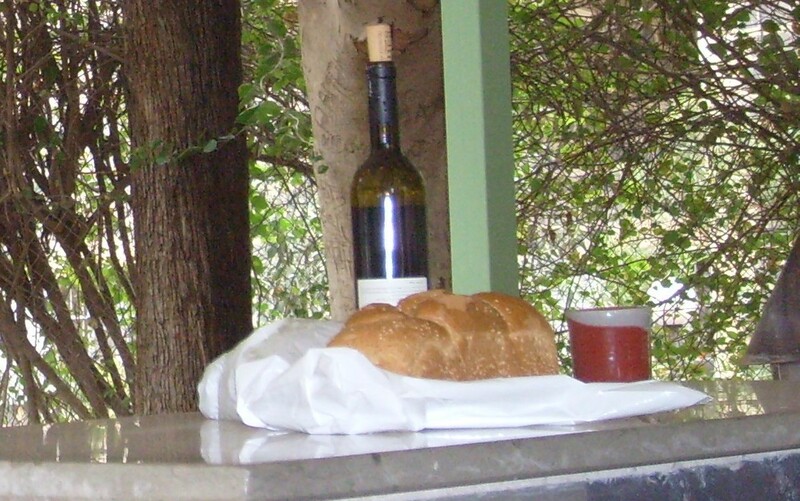 Author Kathleen Norris reminds in a wonderful book called Amazing Grace: A Vocabulary of Faith, that “righteousness is consistently defined by the prophets, and in the psalms and gospels, as a willingness to care for the most vulnerable people in the culture, characterized in ancient Israel as orphans, widows, resident aliens, and the poor” (p. 96). “Look!” Jesus insists. Those of extravagance give out of their abundance. Large sums drop to the bottom of the temple treasury. And even a destitute widow puts in what she can. . . . Though historical interpretation of this text has given the hefty givers a bum rap. Lifting up a give ‘til it hurts stewardship plea that supposedly mirrors the giving of the heroic widow and her two little mites. Think for a minute about what those gifts symbolized to Jesus just a few nights before he would give up his very own life. One commentator writes: “Those coins represent more than money. They represent faith and belief and how these must be lived out in our lives in concrete acts” (Feasting on the Word, Yr. B, Vol. 4, Emilie M. Townes, p. 286). Another commentator writes: “This is the last scene in Jesus’ public ministry. From here all that remains in Mark’s telling is the temple discourse and the passion narrative. So, this widow offers a glimpse into what Jesus is about. He is on the way to giving ‘the whole of his life’ for something that is corrupt and condemned: all of humanity, the whole world” (Ibid., Pete Peery, pp. 287, 289). I’ve heard the two coins symbolize trust. Trust that the people of God would live up to their calling to take care of the widow. Her giving, then, an act that challenges her community to put their money where their mouth is literally. Ensure she has enough; for she’s just given to the glory of God the last two coins left to her. I could stand here on this Commitment Sunday and tell you to give like the widow – pledging on your 2019 Financial Stewardship card all you have to live on. Or I could ask you to ponder for a bit what those coins represent to you. What the offerings of your time, talents, and treasures symbolize for you. I have a hunch some of us would say our offerings represent our faith. Our trust that in life and in death we are held by God. Sometimes by something that feels like a direct connection with the LORD of heaven and earth. Sometimes by the hands of help offered by the person down the pew from us. The calls of concern and willingness just to ask: “How are you?” Faith; trust that we are not alone in this life because of the Presence of God and God’s people may be what our offerings symbolize as we write another check, put in another twenty, or click another link online for funds to be transferred automatically from our account to the church’s. Some might say it’s gratitude. For once I was lost; but now I am found. Blind, but now I see. So, every Sunday we show up. We joyfully give God’s tithes and our offerings because our hearts are full of great thanksgiving. For life. For health. For family and friends. For acceptance. And forgiveness. And new beginnings thanks to God. For being re-created into those who know clear purpose in this life – giving of ourselves for Life in this world. And so incredibly grateful for the gift of ever-lasting Life. Those coins. Our financial offerings symbolize the depths of our gratitude to God. Another might say “my offerings symbolize my responsibility.” A privilege not taken lightly, because of being engrafted into the body of Christ in our baptisms. Taking vows to turn from sin and the ways of evil. Promising before God and everyone to be Christ’s faithful disciple, obeying his word and showing his love. Devoting ourselves to the church’s teaching and fellowship, breaking of bread with one another and being the people of God who pray for the world (PCUSA Book of Common Worship, WJKP, 2018, p. 409). Whether taken first for us by our parents and later by ourselves in our confirmations or promised from the start on our own volition; for some of us those baptismal vows were taken very seriously. When we first said: “Jesus Christ is my Lord and Savior” and when we re-affirm that faith each week, we responsibly intend to live up to those words. Which includes our financial contributions to the church as a way we continue together to uphold our vows. For some of us, giving our money to the work of the church symbolizes part of our responsibility as a disciple of our Lord, Jesus Christ. What do your offerings symbolize to you? If you’ve never stopped to consider, I hope you will today. And I hope you will remember each week when you give just what those tithes and offerings mean to you. . . . Hope that this congregation will go on serving God by serving others as we renew community together and in the wider neighborhood. Reliance upon each other to give a portion of what we have too that together we might continue to be the people of God gathered in this place for worship and service and growth. For respite and care and connection. Trust that God receives all of our offerings – large and small – mixes them all together, then accomplishes so much more than any one of us could achieve alone. God makes miracles occur in all of our lives and in the lives of everyone we meet throughout the week because of what we each have given and received here as a part of this church. This entry was posted in Sermons and tagged 11 November 2018 sermon, Amazing Grace: A Vocabulary of Faith, Baptismal Vows, Commitment Sunday, Financial Pledging, Freud and Signs, Giving, Jung and Symbols, Kathleen Norris, Mark 12:38-44, Offerings, PCUSA Book of Common Worship, Temple Treasury, Two Coins, Widow's Mite on November 13, 2018 by RevJule.